Well incase you didn't notice from my previous post, THE BLONDE IS BACK! My dark hair was fun while it lasted, but I definitely missed my blonde. I just feel more like myself now that it's back. It's made me find a whole new love for my short hair too! I find myself just keeping it simple these days, the whole "less is more" is what I've been feelin' lately. That's why this top totally resonates with my vibes lately. 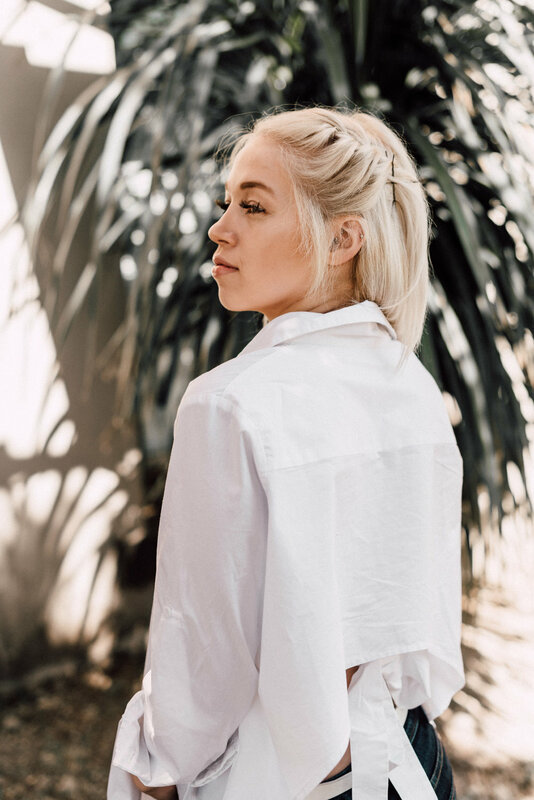 It's a classic, white button up with a bit of a twist. The back of the button up curves up and then there is a bow that you tie in the back! How unique yet simple at the same time! You can shop this top directly by clicking here. I have been working on several fun and creative projects lately and I can't wait to start posting about them. One topic in particular has been on my mind to write about for some time now and I finally wrote it. It felt like a relief to get it out of my brain and onto paper a/k/a Word Doc. So keep an eye out for what will be going up on the editorials section! Hope everyone is enjoying the sun & happy weekend!